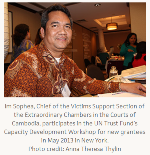 This article looks at access to justice for survivors of sexual and gender-based violence in conflict, in particular in the context of Cambodia. Following the adoption of a new resolution on conflict-related sexual violence by the UN Security Council, UN Women released this article describing the project of VSS, TPO and CDP which is funded by the UN Trust Fund to End Violence Against Women. On 11 and 12 October 2012, CDP in cooperation with TPO and VSS organized the second Women’s Hearing under the title “Asia-Pacific Regional Women’s Hearing on Gender-Based Violence in Conflict”. The English report of the proceedings is now available under Publications and Material. From June 2011 to June 2012, CDP set up and ran the first self-help group for forced marriage survivors under the guidance of psychologist Ms. Yim Sotheary. 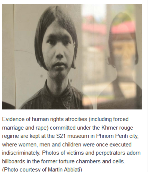 The publication “The Past and the Present of Forced Marriage Survivors – Experience Towards Healing”, authored by Ms. Yim, documents this intervention and its impact on the women who participated in the group. Go to Publications and Materials to download the full publication.